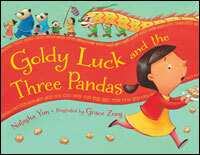 To get ready for the Chinese New Year, which starts January 31 in 2014, we are participating in a blog tour for the lively picture book Goldy Luck and the Three Pandas by Natasha Yim and illustrated by Grace Zong. Goldy Luck isn’t enthusiastic about taking turnip cakes to the Chan family for the New Year. After all, things hadn’t been going that well for her the previous year and she just woke up. Things get even worse when she spills the turnip cakes on the Chan’s floor, is so hungry she eats their food without permission, and accidentally breaks their furniture. Will her bad luck ever end? Author Natasha Yim has built her story on the familiar and comfortable tale of “Goldilocks and the Three Bears,” but has made it fresh by adding details of Chinese New Year traditions and a new ending that gently teaches children about responsibility and conflict resolution. I was not surprised to learn that Yim has training in counseling as well as English, because her expertise shows. Goldy Luck and the Three Pandas is delightful. After reading it, I was excited to come up with some ideas for activities to extend the book. I hope reading it encourages you to learn more about the Chinese New Year and Chinese traditions, too. With a copy of the book, can you spot these items/things traditionally associated with the Chinese New Year (in the illustrations)? 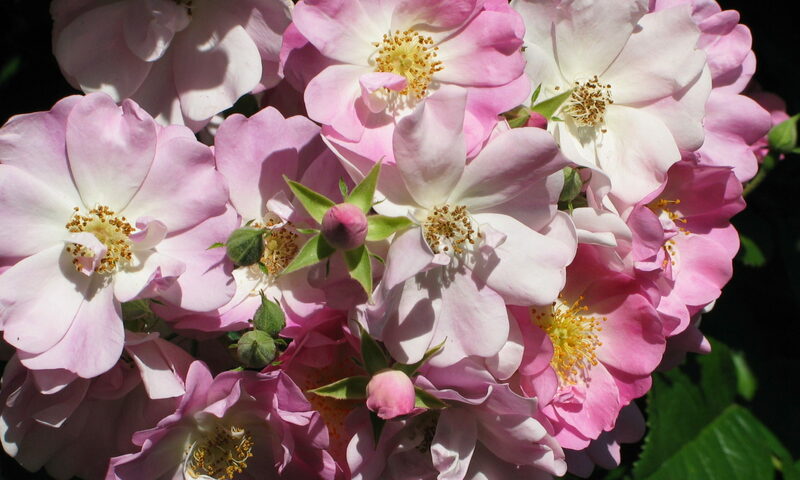 Can you find any other items with symbolic meanings? Use the Author’s Note in the back matter for clues. 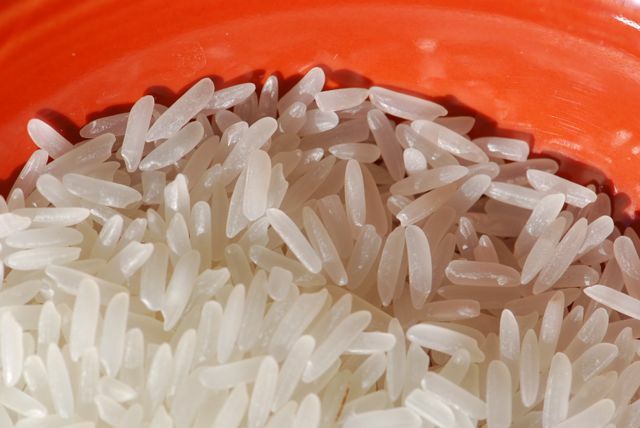 The type of porridge mentioned in the book, congee, is made of rice that has been boiled until soft. Often chicken broth or stock is added for a savory dish, but it can also be made using water and adding fruit or sweeteners when served. A child-friendly congee can be made overnight in a slow-cooker. Have the child(ren) measure rice and water into slow-cooker (crock pot). Cook on low setting overnight, or eight to ten hours. 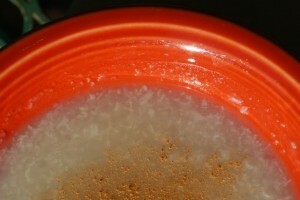 Allow to cool slightly and add ingredients you might add to a bowl of cooked oatmeal. Fruit such as sliced apples, peaches, apricots, bananas, etc. Two out of three members of our household love this! The Red Gingham has a chicken and corn congee made in a slow cooker more suitable for an evening meal. Learning how to use chopsticks is a wonderful way for children to develop fine motor skills and hand strength. For example, Montessori programs often incorporate chopsticks in their lessons. This video shows both the technique of using chopsticks and and some of the traditions surrounding their use. To add depth, the narrator speaks in Chinese as well as English. Aren’t the “Hello Kitty” chopsticks cute? Family Chic has a DIY Dinner Table Game using chopsticks and blocks that looks like a lot fun, and which could be adopted to an educational setting. 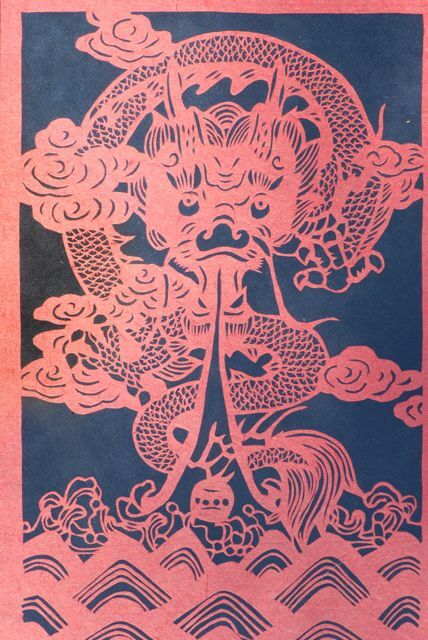 The Chinese have been making paper cut outs or paper carvings called Jianzhi for many centuries. This video contains a tutorial on how to start some simple designs. Fold the paper into a triangle, and then cut shapes from it (basically like the traditional paper cut snowflake). Unfold and see the design. Great for teaching symmetry. Display in a window for the Chinese New Year. For more crafts, try my Chinese New Year Crafts Pinterest board. Be sure to see this guest post about how the book came to be. Disclosures: The book was provided electronically for review purposes by the publisher. I am an affiliate with Amazon so I can provide you with cover images and links to more information about books and products. As you probably are aware, if you click through the highlighted title link and purchase a product, I will receive a very small commission, at not extra cost to you. Any proceeds help defray the costs of hosting and maintaining this website. Thanks for the activities, the links, and the review! I really like this book. Yes, isn’t it great? I think it works from a number of levels. Thanks for the review, Roberta, and for participating in the Goldy Luck and the Three Pandas blog tour. I love all your craft ideas — great fodder for activities to accompany my school visits. Good luck with the school visits! I am so glad I found the Kid Lit Blog Hop. What a fabulous selection of books and blogs. I added it to my Resources for Youth Librarians page, too. This seems like a great read, I plan to get this for a read aloud at school after reading all the reviews! Omigosh – I LOVE that play on words with the title of the book. It looks like so much fun and I love all of the activities that you included in your post. Thanks so much for linking into the Kid Lit Blog Hop. I’m a new follower! Thanks for stopping by. Sorry if any of your messages were slow getting through. Seems like messages I had previously approved are turning up unapproved again. Very weird.